Help is on the way. We've rounded up ten programs to help you do all that and more. Note that this article covers only Office add-ins, not free alternatives to Office such as OpenOffice.org or LibreOffice. Xobni includes a tool for analyzing your e-mail use. This great, free add-in makes Outlook more powerful in numerous ways. First, it indexes your mail and lets you quickly find any e-mail message far more quickly and effectively than Outlook's built-in search tools do. It also integrates with social networking sites such as Facebook to grab information from there and display it in Outlook. It integrates with Skype, too. Another Xobni tool analyzes your e-mail use. There's also a for-pay version available--Xobni Plus--that carries a $30 price tag but offers more-powerful search tools and such amenities as AutoSuggest for completing e-mail addresses. PocketKnife Peek lets you view HTML files as plain text. CompanionLink syncs Outlook with Google Calendar and Gmail. If you use Outlook as well as Google Calendar and Gmail, you have a problem. Your Google calendar won't sync with your Outlook calendar, and your Outlook contacts won't sync with your Gmail contacts. To manage the situation, you need CompanionLink for Outlook ($40, with a 14-day free trial). It syncs Outlook, Gmail, and Google Calendar automatically, so you don't have to double-enter information or reconcile conflicts when calendars and contacts don't match. It's also a great tool for Android-device owners, who can use it as an intermediary to sync Outlook contact information to their Android. Google Cloud Connect harnesses the document-creating prowess of Office to the document-sharing and -storing excellence of Google Docs. Microsoft Office is a great tool for creating documents, but it's not so great for sharing them. Google Docs is fine for sharing documents and storing them in the cloud, but it's much weaker than Microsoft Office at creating documents. Google Cloud Connect for Microsoft Office--a free app authored by Google--helps you get the best of both packages. It lets you save your Office documents to Google Docs, and then it syncs them automatically. 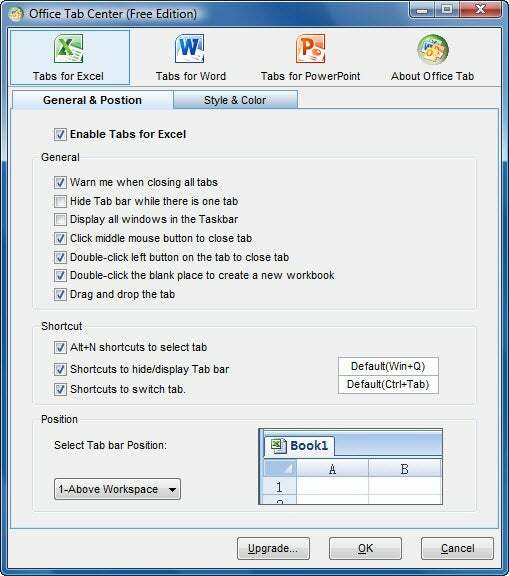 Office Tab Free gives Word, Excel, and PowerPoint a tabbed interface. Normally, keeping track of multiple open documents in Office is hard--but Office Tab Free makes tracking easy. It gives Word, Excel, and PowerPoint a tabbed interface, just as in a browser, with each document opening in its own tab. That way, you can see at a glance what documents are open in an app, and then switch to it by clicking. There's also a 32-bit for-pay version of Office Tab (priced at $25) that offers extra features such as the ability to close all tabs with a single click. Office Tab Free comes in 32-but and 64-bit flavors. 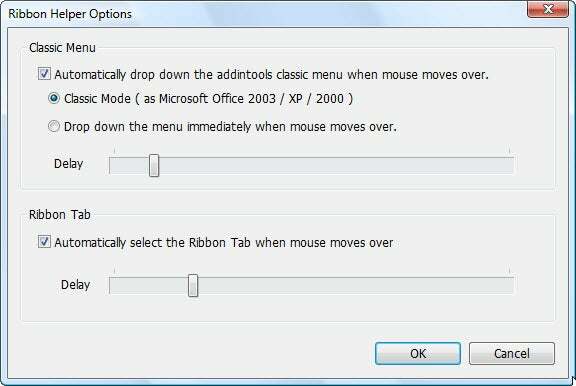 Ribbon Helper lets you change Ribbon tabs by hovering rather than clicking. Search Commands connects you with the command you need to perform the task you want done. Not sure how to perform a certain task in Office? Join the club. There's so much power packed into Office that knowing how to use it all is a challenge. Search Commands, a freebie from Microsoft, makes it easy to find out how to perform complex tasks; then it guides you through the process by jumping you directly to the command that does the job. Search Commands integrates directly into Word, Excel, and PowerPoint as a new tab on the Ribbon. Click the tab, type in the task you want to accomplish, and Search Commands shows you a list of matching results. Click any of those results, and you'll be guided through the process of performing the task. Slideboxx makes assembling a slide-based presentation remarkably easy. If you do lots of presentations and have a hard time finding the exact slides, information, and source presentations you want, give Slideboxx a try. It indexes your presentations and helps you find what you want, lightning fast. That's just the beginning, though. You can drag the slides to a presentation pane and build new presentations from existing slides. Anyone who often reuses slides in different presentations will find it a big time-saver. Slideboxx Prime costs $119, but the 30-day trial version is free. Advanced Office Password Recovery uses various techniques to find passwords that you've forgotten. What happens if you password-protect an Office file but then lose the password? If you use Advanced Office Password Recovery Home ($49), the file won't be lost to you forever. It starts by checking previously found passwords and passwords that are parked in your computer's cache; then it moves on to more-powerful dictionary and brute-force attempts to recover the password.The demo version of the program is free but can recover only passwords of five characters or fewer. 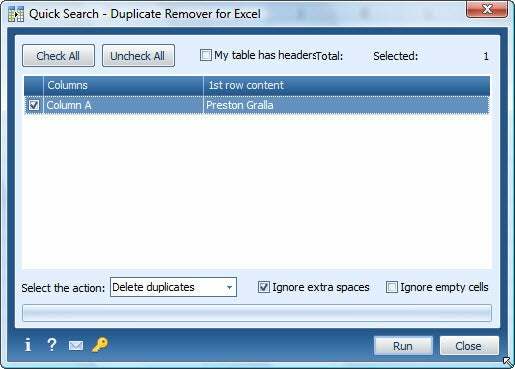 Duplicate Remover tracks down and deletes duplicate entries on massive Excel spreadsheets. If you have worksheets that contain lots of data-- thousands of rows, say--you know how maddening it can be to track down and kill duplicate data. Duplicate Remover for Excel ($30) does a great job of finding and expunging them. You can instruct the program to do it automatically, or you can launch a wizard that walks you through the steps.